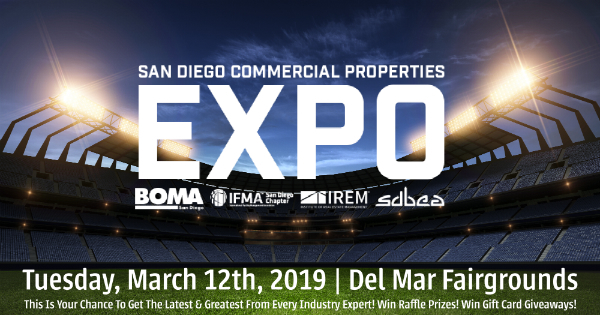 FOUR of our local industry organizations have teamed together to deliver a PHENOMENAL expo from these influential groups: BOMA, IFMA, IREM & SDBEA! What does this mean? We’ve QUADRUPLED your exposure to include all the major players in the commercial real estate industry. This expo will represent the best of the best. It’s a MUST ATTEND event! Tuesday, March 12th, 2019. 3PM to 6PM. Happy Hour! Wyland Hall at Del Mar Fairgrounds. It’s centrally located and there is ample, free parking! If you’re a vendor AND a CURRENT MEMBER of any of the four organizations (BOMA or IFMA Associate Members, Friends of IREM, or SDBEA Allied Members) you can register as an exhibitor. DO NOT SIGN UP AS AN ATTENDEE. Attendee registration is ONLY for Building Owners, Facility Managers, Property Managers & Engineers. The only vendors that will be allowed into the trade show are paying exhibitors. Starting at $600 for a standard 6ft table if you register by Jan 31st! An additional fee of $100 will be assessed if you need electricity. If you are an Annual Sponsor, please see details below for Annual Sponsor discounts. Each exhibitor is limited to 2 reps per table. That’s right. If you want more than 2 people to represent your company, you’ll have to buy another table. Unless you’re a Platinum Sponsor. See below for Platinum Sponsor benefits. You also want to have giveaways, marketing material, etc., and whatever it costs to decorate your booth! Please go all out and make it fun for the attendees - we’re awarding 1st, 2nd & 3rd place prizes for the best booths! For the cost of registration, each rep will have access to light refreshments and one drink ticket. After Jan 31st, the cost will go up to $650 for a standard 6ft table. Registration will close on February 28th. Are there discounts for Annual Sponsors? Platinum Sponsors 30% off. Platinum Sponsors also have the option of bringing 2 additional reps (for a total of 4 company reps on the expo floor). Register the first 2 online today, then send the other 2 names to your organization’s administrator. Contact info is listed below. Gold Sponsors 20% off. Silver Sponsors 10% off. The discount is only applicable to your booth registration (not to sponsorships). If you have not received your discount code, please contact your organization’s administrator (contact info provided below). TEAM SPIRIT! Think the grid iron, March Madness! Any team/sport that you want to represent. What I need before starting my registration? Full name, phone number and email address of Primary Onsite Attendee. That means the person exhibiting. Full name, phone number and email address of Secondary Attendee (if applicable). The name of the organization(s) of which you are a member. If you’re an Annual Sponsor, the discount code sent in the registration email. Please reach out directly based on which organization you are registering through.